The war against terrorism gathered a momentum on Friday when troops serving in the Operation Lafiya Dole operation killed at least nine Boko Haram members in an ambush. Deputy Director Public Relations, Theatre Command Operation Lafiya Dole, Colonel Onyema Nwachukwu, confirmed the development to Channels Television. 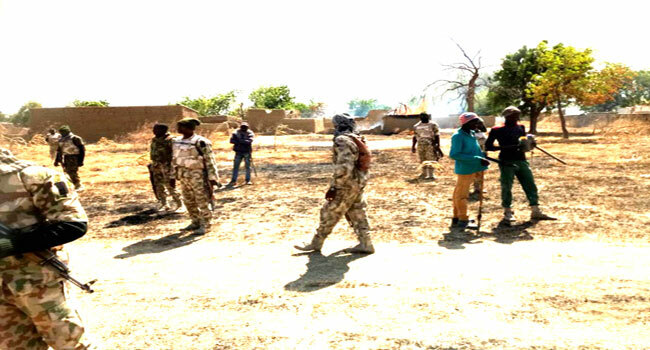 “Troops of Operation Lafiya Dole conducting blocking and clearance operations to track down and neutralise Boko Haram insurgents fleeing from the Sambisa forest have killed 7 Boko Haram insurgents yesterday,” he said in a statement on Saturday. According to Nwachukwu, the insurgents met their Waterloo while trying to escape Kusheri Ardodam along Magumeri in Borno State. Exhibits recovered by the troops include Two AK 47 rifles, three Magazines and 18 rounds of 7.62 mm NATO type ammunition. The military spokesperson also blamed the attacks on civilians in the troubled northeastern state on what he termed as the frustration of the insurgents who are feeling the heat of the counter-terrorism war. Nwachukwu stated further that troops also recorded success in an offensive against the fleeing insurgents in Multe Lawanti, South of Furfur in Damboa area of the state. During the encounter, the soldiers were able to recover one AK 47 rifle, three motorcycles, two bicycles, spanners and clothing from the terrorists. Nwachukwu further reiterated the commitment of the military in winning the war against terrorism in the northeast.